Both beginners and avid collectors will appreciate the attention to detail on this piece! 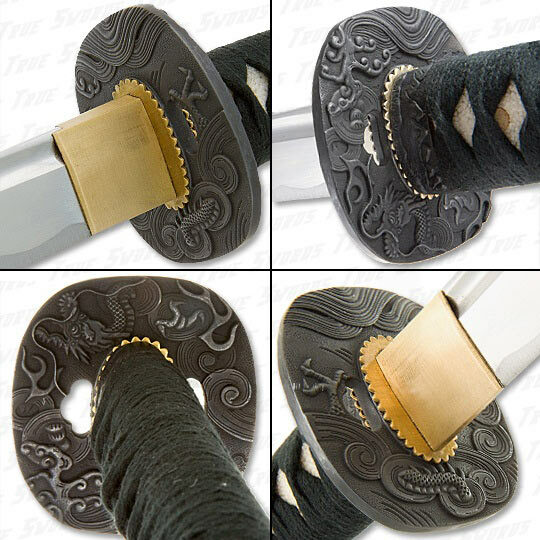 From the high carbon steel blade, to the tight cord wrap (Ito) and metal alloy guard (Tsuba), this sword is fully functional in every sense. The full tang blade extends to the end of the hardwood handle and comes razor sharp and thick. The wooden scabbard (Saya) includes a high gloss finish, nylon cloth, and metal Kurigata fittings. 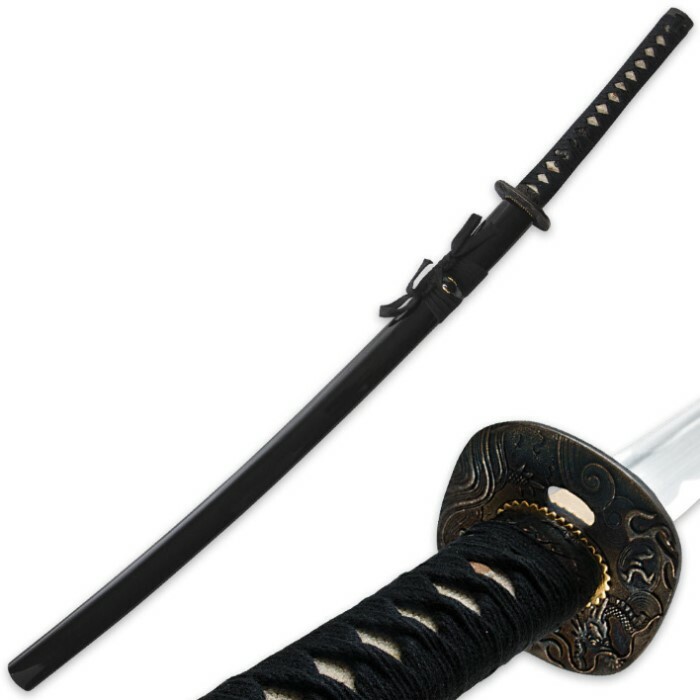 Take hold of your fantasy with this highly sought after samurai sword! This is my second review as the first on was cut short due to user error. LOL!! Im very happy with the quality and prompt delivery. This is my seventh order and have yet to be dissatisfied. As advertised this sword is very sharp and well assembled. I have thus far found zero flaws. I will continue to order from True Swords as long as they continue to sell quality swords such as this. 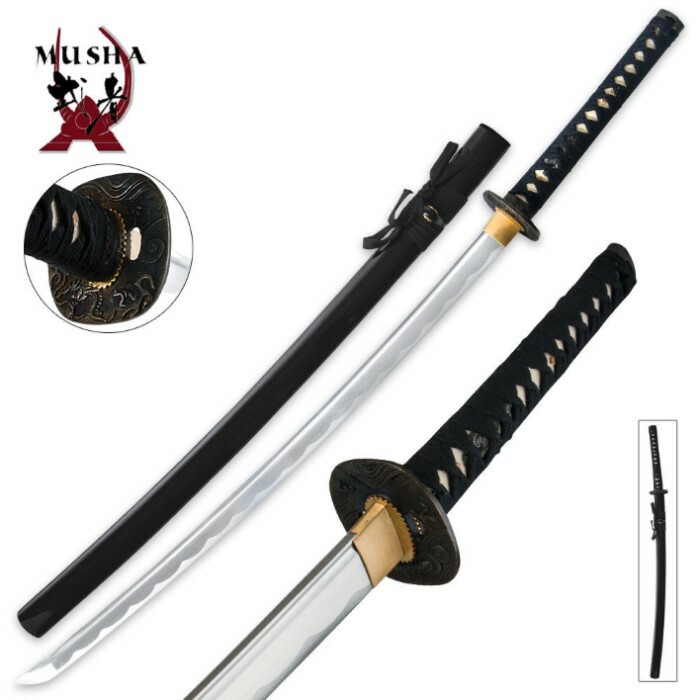 Best katana under 60 bucks. The fit, finish, feel and overall quality matches the price. My only real complaint is that it needs more steel in the handle. It is full tang, just not beefy enough for good balance and rigidity. where do I start, the blade looks nice, its straight, came oiled, fittings are tight. Only complaints here are that on my particular sword the wrap on the handle was poorly done and doesnt look like its going to stay forever, and the blade was only fairly sharp, not even close to razor sharp, ill have to learn to use my whetstone better. all in all great sword for the price you cant beat it. Ive been shopping from trueswords for years thanks guys. I just received my sword and this was my first sword and it is absolutely amazing i but thru its test today and it performed very well but it does not come razor sharp but just a few minutes with the stone it comes almost exactly like the picture the only thing different was engraved on the piece at the end of the handle there is a samurai holding his sword while on a horse. Few imperfections. First the Habaki was extremely loose and looks odd and different from the on the picture. Second the wooden pegs were poorly put into the tang holes, however were not loose. Third the tip was blunted and looked as if it was already used and returned. Forth the blade rattles a little bit in it's sheath and also just from sheathing and re-sheathing the blade a few times, it is already very loose and won't stay in nice and snug anymore. Last and most importantly is that the entire sword it self is bent in one way. From the tip to the handle it looks like a parentheses ). I just got this for a few hours too. Overall not bad for the money. Might just me mine, but I'll try fixing some of the problems by me self. I'm so in love with this sword. The quality of it is awesome for such a cheap price. Delivery was amazingly quick. True Swords has yet to let me down. This is a great sword for an unbeatable price well balanced sharp and the make of it is just stunning. I practice my nikitsuke,chiburi, and noto everyday with this sword since I got it and it is amazing.